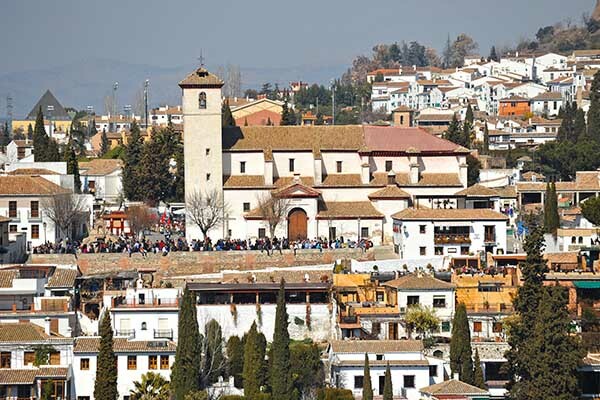 El Albaicin Granada: Everything about the historic district of El Albaicín. 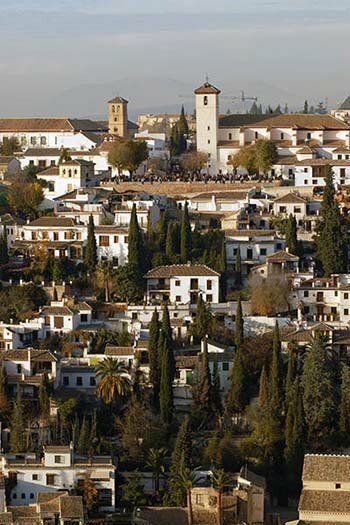 What sights do you have in the Arab district of El Albaicín in Granada? 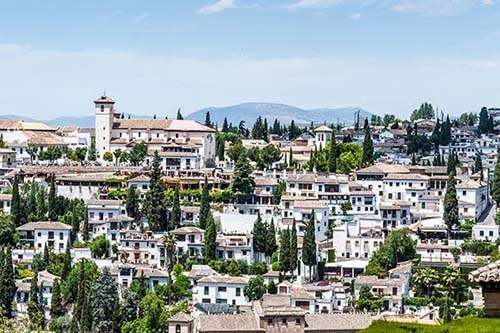 The Albaicín is Granada's oldest Arab district situated on the hill across from the Alhambra. In the 13th century, this was a prosperous district with a slew of palaces and villas (cármenes). 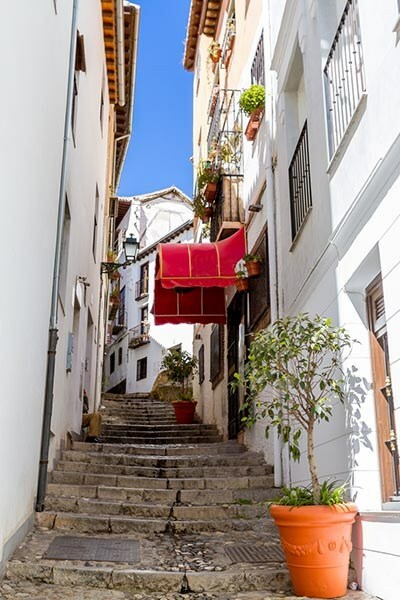 The Moorish Albaicín district became a maze of narrow streets and squares combined with a multitude of whitewashed houses. 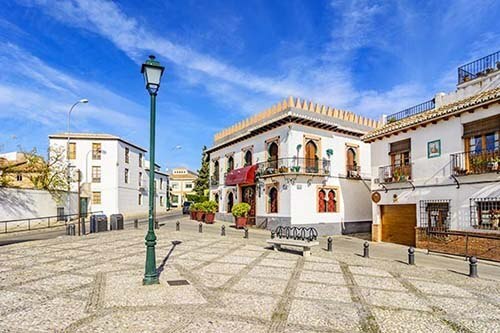 After the reconquest of Granada by the Catholic Kings in 1492, the original mosques in this Moorish district were torn down and replaced with churches. The following centuries, the district has known alternating periods of prosperity and decline. Nowadays, only one Moorish palace is left standing in this district, the so-called Dar al-Horra from the 15th century. Another Moorish remnant are the Arab baths (El Bañuelo) that were preserved because they were built above houses. 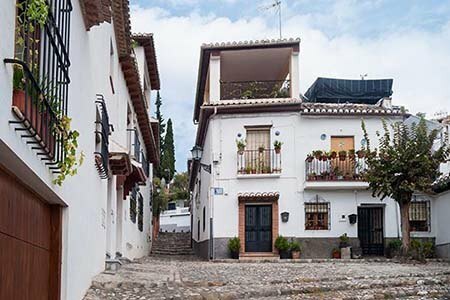 Although the Albaicín district is very touristic, a walk through this Moorish quarter should certainly be part of your Granada city trip. Palacio Dar al-Horra, a 15th-century palace. El Bañuelo, the 11th century Arab bathhouse. This church was built in the 16th century on behalf of the Catholic couple in the place of an ancient mosque. 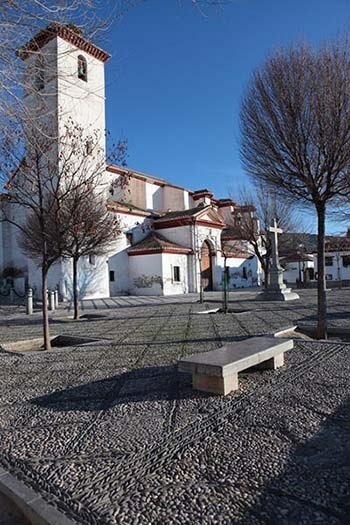 The church is in the middle of the Albaicín and at the square in front of the church, Plaza de San Nicolas, you have a great view of the city of Granada, the Alhambra palace and the Sierra Nevada. This Mirador de San Nicolas is well worth a visit and here you can make the most beautiful pictures of the Alhambra (including at sunset). Archaeological Museum located in a magnificent 16th century mansion with objects from prehistory to the Renaissance. Currently, this museum is closed for a long time because of a renovation. This imposing building was built in Renaissance style by Philip II in 1530 on the Plaza Nueva. Several courts in Andalusia and southern Spain were run from the chancellery and also included the Supreme Court. Opposite the Royal Chancellery at Plaza Nueva is the church of Santa Ana. This 16th century church is made of brick and built in mudejar style. Characteristic are the beautiful portal and the minaret tower in which a bell was later placed. Just before you arrive at the higher parts of the Albaicín you arrive at the Paseo de los Tristes; a cozy street with a fountain and terraces with a beautiful view of thet Alhambra. 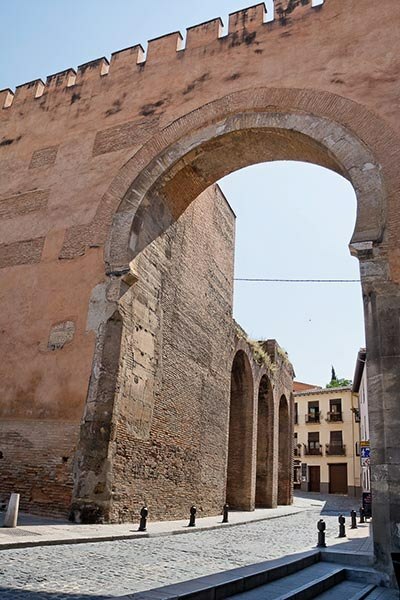 These city gates come from the 11th century and are built in continuation of the Albayzín fortress. These walls included the entire Albayzín district. Four gates are still intact: Puerta de Monaita, Puerta de Elvira (foto), Puerta Genil en Puerta Nueva. 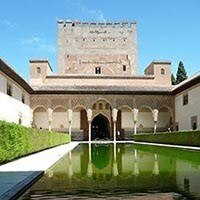 Where is the Albazyn district in Granada?